As my son is getting older, it's time that we start transitioning him from a bottle to a sippy cup. One thing I love about Playtex is that they have cups that help transition your little one from four months and up and as you all know from reading our past experience with Playtex, that their products are something I trust and know I can depend on. Training Time: – TrainingTime cups are designed to help transition from bottle to sippy cup and come in spout and straw formats for ages 6 months+. AnyTime: – AnyTime cups are designed to be easy for little hands to hold so your child easily controls the flow of liquid. Available in a variety of spout, straw and spoutless formats for ages 9 months+. PlayTime: – PlayTime Insulated cups are break proof and 100% Leak-proof guaranteed*. Insulated to keep drinks cool. TravelTime: – Your little one is all grown up and ready for their next adventure! TravelTime Insulated cups are 12oz and insulated to keep drinks cool. We decided to go with their Training Time Soft Spout that's for babies four months and older. 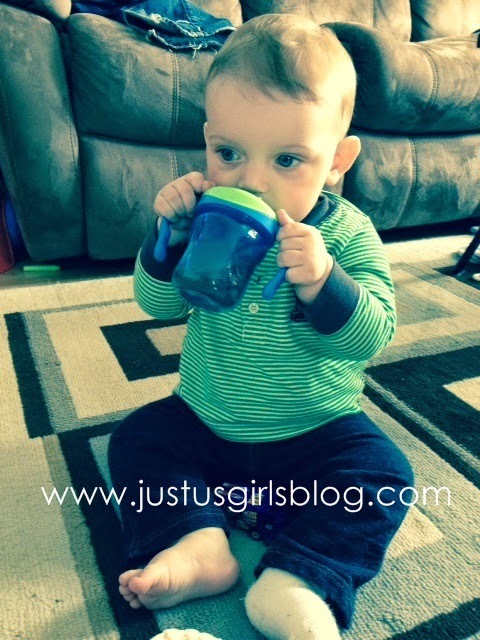 Not only was this a great cup to start with, but it was also pretty easy for my son to get the hang of using it. We have tried a few different ones, but he definitely prefers this sippy. It lasts long, is very durable and quite simple when it comes to cleaning and use. I love that he is able to hold as the cup is easy to grasp and small enough to fit in his hands. The fact that it's dishwasher safe is a bonus because it's already very easy to clean if you didn't want to use your dishwasher or didn't have time to wait through a cycle. I would consider this cup for babies that are old enough or your toddlers if you're still searching for the right cup to start with. The Playtex Twist ‘n Click cups are available at all major retailers across Canada. Also for more information on new products from Playtex, be sure to follow them on their Facebook!